Spanish last names are common around the world and have a vibrant history. They can be traced back to the days of ancient Rome, Visigothic invasions, and the Spanish Inquisition. Here are some of the most popular Spanish and Mexican last names, their meanings, and an explanation of how they came to be and the stories behind the names. 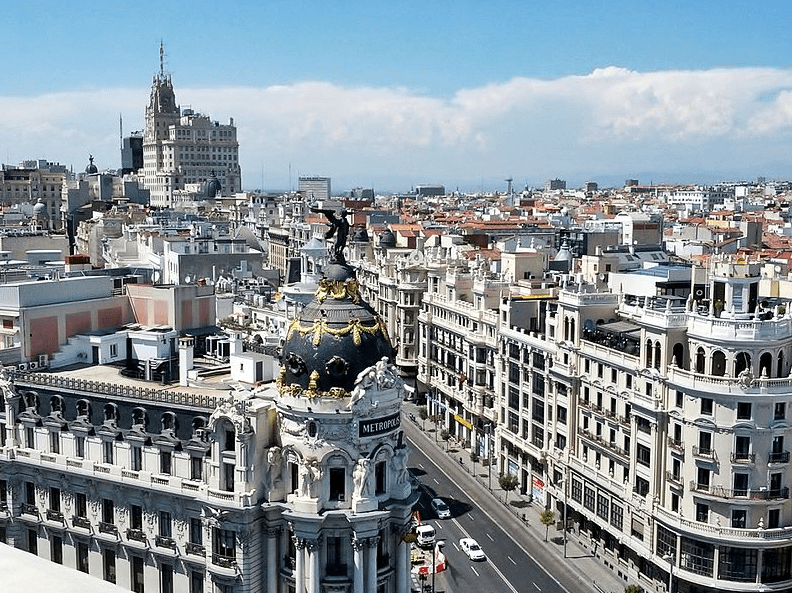 Photo: Madrid, Spain. Credit: Justraveling.com (http://www.justraveling.com); Wikimedia Commons. Most people in the Spanish-speaking world have two last names. The first was taken from their mother and the second from their father, both of which are the first of their parents’ own two last names. This naming tradition has existed for centuries and was first made popular by the Castilian kings of Madrid. However, this naming convention did not become the norm until the 1800s. As with other European last names, many Spanish surnames originated as a descriptor of the person, where they came from, or their trade. In addition, people were often named after their parents. At the end of many Spanish last names are the suffixes: -ez, -az, -oz, and –iz. These suffixes all mean “son of,” turning last names into identifiers of parentage. For example, Rodrigo Sánchez means Rodrigo son of Sancho. Patronymic naming, although somewhat outdated today, is still apparent in the versions of many of the most common Spanish and Mexican last names. Martín: coming from the Latin word Martinus – the late-period name of the Roman god of war, Mars – Martín is an incredibly common surname and given name throughout the Spanish-speaking world. Martin is also the most popular surname in neighboring France, though this is often attributed to St. Martin of Tours. Rodríguez: a patronymic name directly translated to mean “son of Rodrigo,” the name itself is taken from the Spanish form of the Germanic name Roderick, meaning “famous power.” The widespread use of Rodríguez may be due to the fact that one of the last Visigothic kings of Christian Spain was named Roderic, cementing the name as a symbol of resistance during the Caliphate of Cordoba. García: widely thought to be the Spanish version of the ancient Basque name Gaztea, there are also a number of different theories as to the origins of García. Whether it means “young bear” in Basque, “young warrior” in an early Germanic tongue, or “graceful prince” in Visigothic, García remains the most common Spanish last name and second most common Mexican last name. Fernández: “the son of Fernando” derives from the Germanic name Ferdinand, meaning “brave traveler” or “adventurous journey.” Its historical variants also include the widely popular Hernandez. González: the second most common of Spanish last names has its origins in the Germanic name Gundisalv. Though some scholars believe the name means “war hall” or “castle,” others feel that only the first part of the Germanic phrase, gund (meaning “war”), can be suitably translated, while the remainder, salv, is still a mystery. López: meaning “son of the wolf,” López comes from the Latin word for wolf: “lupus.” For those familiar with Roman history, Romulus, a literal son of a she-wolf, was the founder of the city of Rome. The name López, though originally a patronymic name, does reference the glory days of Rome and its Hispania. Pérez: a patronymic surname with Hebrew origins, Pérez means “son of Pedro or Peter.” The name is thought to have originated from the son of the Biblical character Judah, Perez, which in Hebrew means “to burst forth.” Many Sephardic Jews living in Spain during the Spanish Inquisition adopted the name to escape persecution, as Pérez sounded Spanish to the authorities but still maintained a link to Judaism. Martínez: a patronymic variation of the Spanish last name Martín. It is widely prevalent in Spain, Latin America, the U.S., and France. Last names with Spanish origins provide a link to the past, an understanding of who our ancestors were. Use your last name and search our collection of Hispanic American newspapers to trace your Spanish ancestry. Newspapers captured the events which defined our ancestors’ lives. From marriage and birth announcements, to articles covering local events, find long-lost relatives and details about your ancestors’ lives in newspapers. By understanding our roots, we uncover the lives of our ancestors – and in turn, learn more about who we are today.